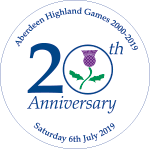 Tickets to the 2019 Aberdeen Highland Games are now available for purchase. Don't forget to pre purchase your tickets for considerable savings over the gate price. Bush camping site is conditional to complying with Council regulations as sign posted. Ablution block available but NO ELECTRICITY. Tickets to be displayed. Valid from the Wednesday to Sunday. Online tickets can be swapped on the day for a wristband to allow you to come and go from Harrison Oval as you please. Camping tickets are also available for campsites on Jefferson Park; these are valid for Camping Sites from Wednesday before the Games till Sunday following the event. Tickets for the Aberdeen Highland Games Ceilidh 2019 are also available. A Ceilidh is an informal social gathering, with songs, story-telling, music and dancing for the whole family and is always a highlight of the Aberdeen Highland Games. Pre-purchased tickets are essential and very popular and with limited numbers available don’t delay and risk missing out on this great event. More information about this years event and ticket sales can be found on the Ceilidh page.